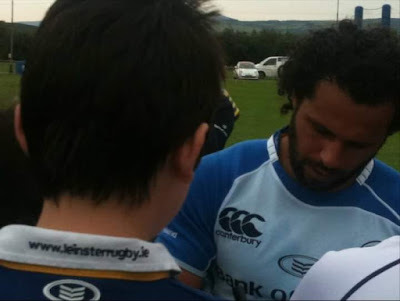 The first photo was taken in the summer of 2010 at Clondalkin RFC. I brought my kids on the annual pilgrimage to the Leinster Rugby open training session, and this is one of many pictures I took that day; others show them with Jamie, Johnny, Shaggy, BOD…though there were none with the new head coach Joe Schmidt. But that's not a complaint that he didn't pose for pictures, far from it. Since most people wouldn't have known too much about him, he cut a very unassuming presence on the day, quietly going about his business of monitoring his new charges. All I knew was that he was a Kiwi, had coached in Ireland at junior level before, and his latest gig involved organising the back line of a very strong Clérmont team. I do remember remarking how fortunate he was going from a team with one strong powerful 13 in Aurelien Rougerie to one with BOD. 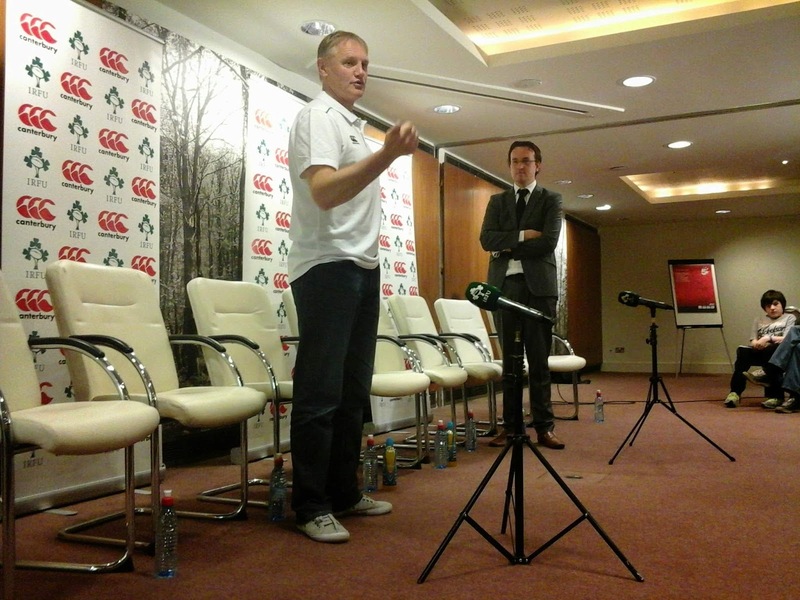 It was now the summer of 2014 and it's safe to say everyone who follows Irish rugby knew who he was by then!!! First two seasons at Leinster, two Heineken Cups. Then to make up for not winning it the third season, his team won everything else instead. On to the national side, where in just his third game in charge he came within a few “system errors” of beating the All Blacks before adding two successive Six Nations titles to his personal trophy haul. I was invited to join a select group of Irish fans at an outing in Carton House where we were treated to lunch, a new Ireland test jersey signed in our presence by several players, and as you see in the photo, a little chat from Joe. But for this blogging rugby nerd by far and away the best part was when I got to see an Ireland training session in progress. This time you can be damn sure I was only paying attention to what Joe was doing, although the hum of the drones flying overhead taking footage for the coaching staff to pore over was also distracting. As we watched, Schmidt took a group of backs like Tommy Bowe and Gordon D'Arcy over to one side to give a mini clinic on catching high kicks. Before that day I always assumed that launching the ball in the air was a last resort akin to gridiron's “Hail Mary” pass, but the way he described how the attacking team should approach them, you'd almost be disappointed if you didn't win the ball back every time! Next for Ireland followed disappointment in RWC2015 as well as England having the nerve to prevail in the springs of both 2016 and 2017 prompting one, shall we say, ‘prominent’ commentator to suggest he was the “worst coach/selector in Irish rugby history” (I almost feel dirty linking to that but I reckon it serves both as part of the story and shameful to the author). Since that article, Ireland regrouped to break the duck against Joe's land of birth, win a Grand Slam, win a test series down under, and just the other weekend, notch a second triumph against the world number ones which puts us within striking distance of actually overtaking them. After all of that success, and after all the quality players that have come right through the system to test level with more to follow on the way, now seems to be the perfect time for Joe to make a decision on his future and whatever about what we want as fans, we can't argue that the man has earned the right to do it his way. Plus, we now have plenty of time to let it sink in not only before we go to Japan, but also before we host the English in February to begin defending that Grand Slam. There's a whole lotta Schmidt-ball ahead for us to enjoy, and we're all looking forward to giving all of them our full support. Part ten of our series looking at the various Irish Jersey has reached out-half, playmaker, first five-eighth, stand-off, whatever your name of choice might be. When I started this site over ten years ago, I was far from Johnny Sexton's biggest fan. I was sure he was a prospect for the future and all that, but I was also greedy for Leinster to do well in the present and assumed Felipe was the one to bring that success. But then Dr Phil limped off the field at Croke Park and when I finally looked from behind my hands, I saw exactly the kind of x-factor this youngster clearly knew he already had. I have already outlined Joe Schmidt's successes above so if I did the same with Johnny I would mostly be repeating myself. But the thing about Sexton is that he gets the job done by doing his own thing, not what he thinks a coach would want him to do, and part of Leinster & Ireland's “secret sauce” came from Joe leaving him to it. You could analyse his backline moves for hours; their success rate at advancing the ball up the field is staggering. It's almost like watching Riverdance in that not only do the main players have set roles to play, so do everyone on the pitch, be it support runs, dummy runs, you name it. And no matter how small your part, chances are you'll be brought up on it if you don't perform. Some might say his Racing years were a step backwards but I believe his overall career benefitted from them. As impressive and all as the Irish rugby set up may be, it can still be seen as a ‘bubble’ and to have such a senior player gain some experience from outside can only serve to help. After Johnny in the Irish set up we have Joey Carbery. I like the way Joe is sticking with him, since it's clear he firmly believes he's the heir apparent, though it would be nice to see him stringing a run of headline displays soon down at Munster, save for December 29 of course! The thing about Joey is that he's a different kind of player to Johnny, relying much less on structure and method and much more on sizing up what's before him. That can be good for someone coming off the bench for a team like Ireland...if an opposition have a plan to thwart us that's working, he's a good option for mixing things up. But is he our best option for starting if, heaven forbid of course, Johnny is somehow unavailable? Ross Byrne's stock has risen slowly but surely in his time at Leinster and now he seems to have established himself as Joe's number 3. He is very composed on the ball and is particularly good at the kick pass which is a decent string to have to your bow. I'd be surprised if anyone else was in consideration for Joe's World Cup 23 at this stage, especially with Conor Murray able to deputise in a pinch. But should injury force one of them out of the Japan picture, there is Ian Keatley, who has logged in a good few Carton House hours in his day, JJ Hanrahan and now also Billy Burns along the line of succession. But none of them get near Johnny when he's fit. I know that goes without saying given he's World Player of the Year and all, but I'll say it anyway. It was the 7th of January 2015 when the news came through that Jimmy Gopperth was to leave Leinster. Of course nobody could begrudge him looking at his own future…most knew Sexton would return. But I still had serious problems regarding this news. You see, Gopperth had decided to join Premiership outfit Wasps at the end of the season, and what made that a problem was that Leinster were to play them just a couple of weeks after the announcement in what was bound to be a decisive Pool 2 fixture in the Heineken Cup. Does that mean I felt Gopperth would ‘throw’ the game for Leinster in favour of his new employers? Of course not. These guys are professionals who play the game on the day, not ones weeks or months down the road. Yet for me that still doesn't make it right. Announcing the move in early January must have meant the approach came long before, yet surely AFTER it was known that the two clubs in question would be playing each other twice in the biggest club competition. Now we have a situation whereby Stuart Lancaster is being linked with the Bath job just a number of weeks off a crucial European double-header. I don't care how professional these people involved may be; I really don't think the timing of such approaches should be ok.
That said, how do you prevent it? I mean we've all seen enough spy movies to know there are infinite ways to get a message to someone that you're interested. Perhaps the problem isn't with the approaches themselves, rather the fact that they are made so public? I really don't know what the answer is, or if any kind of legislation can be written to prevent it happening, assuming the legislators wish to do so. But I just don't like it, and not only because in the two cases above they involve Leinster personnel. Who among us rugby fans hasn't had a moan about the ref? Imagine what that must be like for coaches? Leinster travel to Newport this coming weekend to face the Dragons, now coached by ‘friend of the blog’ Bernard Jackman. It was always going to be a tough assignment for him, and the first season and a half have seen limited success for the Men of Gwent. Plus it is well known that the fans at Rodney (or ‘Dave’ as old BBC sitcom fans like to call it) Parade tend too be among the most partisan out there…every pass by the opposition is forward, every tackle a penalty, every move by potential tacklers offside, etc etc; so I'd say after a frustrating 80 minutes where your team has suffered a loss can have you fit to be tied. "It is not acceptable in a match of that magnitude to have such a poor performance." To reference another old BBC sitcom… “Language, Timothy!” I hope young children weren't listening to that expletive-filled tirade! I can certainly understand why that disgusting vitriol earned him a four-week ban from the coaching box! Maybe I'm being sarcastic? No maybe about it. Of course the blazers have to draw a line somewhere, and I suppose if Jackman crossed that of the WRU then so be it, though at least they knocked it down to just two matches with mitigation. But the ban does seem a bit extreme at face value. Wales Online did an interesting follow up piece whereby they asked him exactly what he did for the first game of the ban, against Edinburgh, ironically coached by Richard Cockerill, no shrinking violet himself when it comes to railing on refs. Obviously we wish him all the best at the region, though maybe not this weekend. They do have some players that can do some damage - Leinster will need to be careful whether their supremo is on the premises or not. More on that in our preview Friday. WAVE GOODBYE TO THE WAVE? Whenever I visit relatives in California I try to take in a baseball game for my favourite team the Oakland Athletics. It's always a great occasion at the Coliseum and not too expensive either. My aversion to the so-called “Mexican Wave” is for multiple reasons. For one thing when you're a sports nut yourself it's frustrating to see swathes of people, who clearly paid as much as you did to be there, so bored by the action on the pitch that they feel compelled to do something like that. But when it came to the baseball, what I couldn't get was when the fans, the vast majority of which were for the home team, would resort to the wave when the Athletics were batting, meaning when it reached one part of the stand the batter could be distracted!!! Stop - you guys could actually hurt your team here!!! As for rugby, we probably have to take a slightly different approach. I'm sure it makes no difference to the players what the fans are up to. But it still annoys me, and that's why I sent that tweet when it happened during the USA test last weekend. And that is indeed a valid point. The fact that I run a rugby blog means I'm deeply involved with everything that happens on the pitch, and the fact that you're reading this means you are too. But as I have often said, not all fans go to use as much of the jargon as they can like we do. There are many who just go to say “Come on Ireland!” and cheer when everyone else does, and the game needs those fans as much as us, probably more so. But having said that, maybe complaining about the wave has become for us rugby nerds what the wave itself is for those ‘newbies’? The match is a bit boring so some choose to fill the time by standing up with arms a-flailing while others choose instead to moan about them? Just different ways of dealing with the same feeling if you ask me. By all means, wave away the next time the mood takes you…just have a little more understanding for the few icy stares you get in the process 😉.